One question we constantly get asked by partnering developers is, “How can I see what I’m gaining from being ranked high for ‘keyword x’?” At the end of the day, app developers who do active ASO want to see improvements in organic installs, page views, and conversion when targeting certain keywords in their listings. Up until now, there has been no clear way to determine how many installs or page views are being driven by searches for specific keywords. Only rough estimations from various ASO tools were available, all of which are based on assumptions. Google has finally released a beta feature in its Google Play Console that provides exactly this kind of insight. The update, located in the “User acquisition” section of the Play Console, now reveals new major insights that significantly enhance transparency of ASO. Our fellow ASO friends from Phiture broke the news. Developers will now be able to see their top 1,000 ranked keywords, along with their individual installs, page views, conversion rates, and retention rates. You can find this insight by going to your Acquisition reports page in the User acquisition section. You will notice that the “Play Store (organic)” channel is now broken down into “Search” and “Browse” (just like Apple provides on iTunes Connect). Clicking on “Search” will open a page with the list of keywords and the new insights. All developers and ASO practitioners should pay close attention to this data. 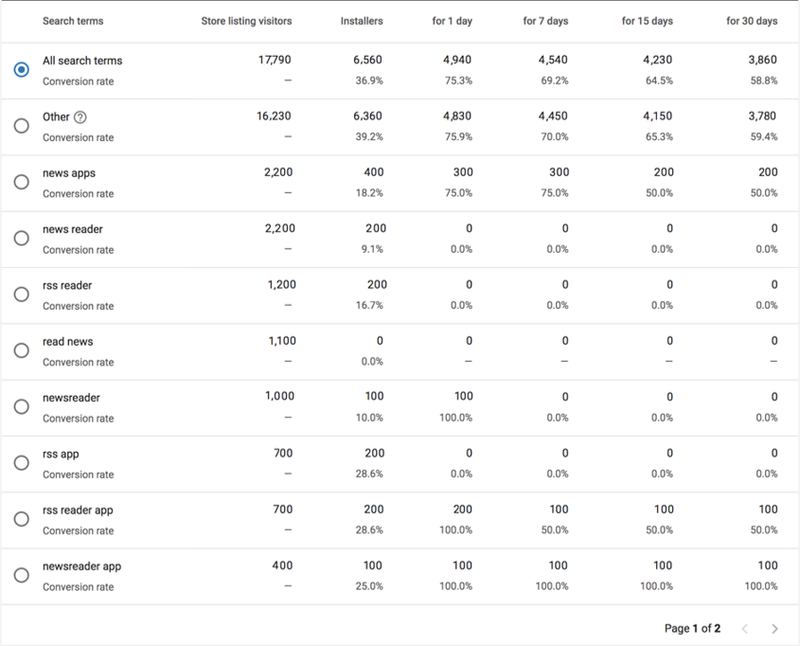 This provides a great indication of which keywords are actually driving value to your app. Not all relevant high-traffic keywords guarantee to bring your app traffic, so this is a good way to identify which keywords are. However, developers should not simply choose keywords to target based on this data. While it shows the amount of traffic individual keywords bring to your app, it does not provide insight on overall Play Store search volume per keyword (which remains a mystery). This data should still be complemented by ASO tools that provide search traffic estimates. It’s also important to keep in mind that, as long as this feature is in beta, the data’s accuracy is likely not 100%. With that said, this data is far better than nothing and beta-testers should definitely begin adding this to their ASO toolbox.